^ 1.0 1.1 1.2 1.3 Rhoades RA, Pflanzer RG. Human Physiology 4th. Thomson Learning. 2002: 584. ISBN 0-534-42174-1. ^ 2.0 2.1 2.2 2.3 2.4 2.5 2.6 2.7 2.8 2.9 Janeway CA, Jr.等. Immunobiology. 5th. Garland Publishing. 2001. ISBN 0-8153-3642-X. (electronic full text via NCBI Bookshelf). ^ Litman GW, Rast JP, Shamblott MJ, Haire RN, Hulst M, Roess W, Litman RT, Hinds-Frey KR, Zilch A, Amemiya CT. Phylogenetic diversification of immunoglobulin genes and the antibody repertoire. Mol. Biol. Evol. January 1993, 10 (1): 60–72. PMID 8450761. ^ 4.0 4.1 Maverakis E, Kim K, Shimoda M, Gershwin M, Patel F, Wilken R, Raychaudhuri S, Ruhaak LR, Lebrilla CB. Glycans in the immune system and The Altered Glycan Theory of Autoimmunity. J Autoimmun. 2015, 57 (6): 1–13. PMID 25578468. doi:10.1016/j.jaut.2014.12.002. ^ 5.0 5.1 5.2 5.3 5.4 5.5 Pier GB, Lyczak JB, Wetzler LM. Immunology, Infection, and Immunity. ASM Press. 2004. ISBN 1-55581-246-5. ^ Borghesi L, Milcarek C. From B cell to plasma cell: regulation of V(D)J recombination and antibody secretion. Immunol. Res. 2006, 36 (1-3): 27–32. PMID 17337763. doi:10.1385/IR:36:1:27. ^ Parker D. T cell-dependent B cell activation. Annu Rev Immunol. 1993, 11 (1): 331–360. PMID 8476565. doi:10.1146/annurev.iy.11.040193.001555. ^ 8.0 8.1 8.2 8.3 Market E, Papavasiliou FN. V(D)J recombination and the evolution of the adaptive immune system. PLoS Biol. October 2003, 1 (1): E16. PMC 212695. PMID 14551913. doi:10.1371/journal.pbio.0000016. ^ 9.0 9.1 Diaz M, Casali P. Somatic immunoglobulin hypermutation. Curr Opin Immunol. 2002, 14 (2): 235–240. PMID 11869898. doi:10.1016/S0952-7915(02)00327-8. ^ Parker D. T cell-dependent B cell activation. Annu. Rev. Immunol. 1993, 11 (1): 331–360. PMID 8476565. doi:10.1146/annurev.iy.11.040193.001555. ^ 11.0 11.1 11.2 Wintrobe, Maxwell Myer. Wintrobe's clinical hematology. John G. Greer, John Foerster, John N Lukens, George M Rodgers, Frixos Paraskevas 11. Hagerstown, MD: Lippincott Williams & Wilkins. 2004: 453–456. ISBN 978-0-7817-3650-3. ^ Wintrobe, Maxwell Myer. Wintrobe's clinical hematology. John G. Greer, John Foerster, John N Lukens, George M Rodgers, Frixos Paraskevas 11. Hagerstown, MD: Lippincott Williams & Wilkins. 2004: 453–456. ISBN 0-7817-3650-1. ^ Underdown B, Schiff J. Immunoglobulin A: strategic defense initiative at the mucosal surface. Annu Rev Immunol. 1986, 4 (1): 389–417. PMID 3518747. doi:10.1146/annurev.iy.04.040186.002133. ^ 15.0 15.1 Geisberger R, Lamers M, Achatz G. The riddle of the dual expression of IgM and IgD. Immunology. 2006, 118 (4): 429–437. PMC 1782314. PMID 16895553. doi:10.1111/j.1365-2567.2006.02386.x. ^ 17.0 17.1 17.2 Woof J, Burton D. Human antibody-Fc receptor interactions illuminated by crystal structures. Nat Rev Immunol. 2004, 4 (2): 89–99. PMID 15040582. doi:10.1038/nri1266. ^ Goding J. Allotypes of IgM and IgD receptors in the mouse: a probe for lymphocyte differentiation. Contemp Top Immunobiol. 1978, 8: 203–43. PMID 357078. ^ Mattu T, Pleass R, Willis A, Kilian M, Wormald M, Lellouch A, Rudd P, Woof J, Dwek R. The glycosylation and structure of human serum IgA1, Fab, and Fc regions and the role of N-glycosylation on Fc alpha receptor interactions. J Biol Chem. 1998, 273 (4): 2260–2272. PMID 9442070. doi:10.1074/jbc.273.4.2260. ^ Roux K. Immunoglobulin structure and function as revealed by electron microscopy. Int Arch Allergy Immunol. 1999, 120 (2): 85–99. PMID 10545762. doi:10.1159/000024226. ^ Barclay A. Membrane proteins with immunoglobulin-like domains--a master superfamily of interaction molecules. Semin Immunol. 2003, 15 (4): 215–223. PMID 14690046. doi:10.1016/S1044-5323(03)00047-2. ^ Putnam FW, Liu YS, Low TL. Primary structure of a human IgA1 immunoglobulin. IV. Streptococcal IgA1 protease, digestion, Fab and Fc fragments, and the complete amino acid sequence of the alpha 1 heavy chain. J Biol Chem. 1979, 254 (8): 2865–74. PMID 107164. ^ Al-Lazikani B, Lesk AM, Chothia C. Standard conformations for the canonical structures of immunoglobulins. J Mol Biol. 1997, 273 (4): 927–948. PMID 9367782. doi:10.1006/jmbi.1997.1354. ^ North B, Lehmann A, Dunbrack RL. A new clustering of antibody CDR loop conformations. J Mol Biol. 2010, 406 (2): 228–256. PMC 3065967. PMID 21035459. doi:10.1016/j.jmb.2010.10.030. ^ Heyman B. Complement and Fc-receptors in regulation of the antibody response. Immunol Lett. 1996, 54 (2–3): 195–199. PMID 9052877. doi:10.1016/S0165-2478(96)02672-7. ^ Borghesi L, Milcarek C. From B cell to plasma cell: regulation of V(D)J recombination and antibody secretion. Immunol Res. 2006, 36 (1–3): 27–32. PMID 17337763. doi:10.1385/IR:36:1:27. ^ 27.0 27.1 Ravetch J, Bolland S. IgG Fc receptors. Annu Rev Immunol. 2001, 19 (1): 275–290. PMID 11244038. doi:10.1146/annurev.immunol.19.1.275. ^ Rus H, Cudrici C, Niculescu F. The role of the complement system in innate immunity. Immunol Res. 2005, 33 (2): 103–112. PMID 16234578. doi:10.1385/IR:33:2:103. ^ Racaniello, Vincent. Natural antibody protects against viral infection. Virology Blog. 2009-10-06 [2010-01-22]. （原始内容存档于2010-11-18）. ^ Milland J, Sandrin MS. ABO blood group and related antigens, natural antibodies and transplantation. Tissue Antigens. December 2006, 68 (6): 459–466. PMID 17176435. doi:10.1111/j.1399-0039.2006.00721.x. ^ Mian I, Bradwell A, Olson A. Structure, function and properties of antibody binding sites. J Mol Biol. 1991, 217 (1): 133–151. PMID 1988675. doi:10.1016/0022-2836(91)90617-F.
^ Fanning LJ, Connor AM, Wu GE. Development of the immunoglobulin repertoire. Clin. Immunol. Immunopathol. 1996, 79 (1): 1–14. PMID 8612345. doi:10.1006/clin.1996.0044. ^ 33.0 33.1 Nemazee D. Receptor editing in lymphocyte development and central tolerance. Nat Rev Immunol. 2006, 6 (10): 728–740. PMID 16998507. doi:10.1038/nri1939. ^ Mraz, M.; Dolezalova, D.; Plevova, K.; Stano Kozubik, K.; Mayerova, V.; Cerna, K.; Musilova, K.; Tichy, B.; Pavlova, S. MicroRNA-650 expression is influenced by immunoglobulin gene rearrangement and affects the biology of chronic lymphocytic leukemia. Blood. 2012, 119 (9): 2110–2113. PMID 22234685. doi:10.1182/blood-2011-11-394874. ^ Bergman Y, Cedar H. A stepwise epigenetic process controls immunoglobulin allelic exclusion. Nat Rev Immunol. 2004, 4 (10): 753–761. PMID 15459667. doi:10.1038/nri1458. ^ Honjo T, Habu S. Origin of immune diversity: genetic variation and selection. Annu Rev Biochem. 1985, 54 (1): 803–830. PMID 3927822. doi:10.1146/annurev.bi.54.070185.004103. ^ Or-Guil M, Wittenbrink N, Weiser AA, Schuchhardt J. Recirculation of germinal center B cells: a multilevel selection strategy for antibody maturation. Immunol. Rev. 2007, 216: 130–41. PMID 17367339. doi:10.1111/j.1600-065X.2007.00507.x. ^ Neuberger M, Ehrenstein M, Rada C, Sale J, Batista F, Williams G, Milstein C. Memory in the B-cell compartment: antibody affinity maturation. Philos Trans R Soc Lond B Biol Sci. March 2000, 355 (1395): 357–360. PMC 1692737. PMID 10794054. doi:10.1098/rstb.2000.0573. ^ Stavnezer J, Amemiya CT. Evolution of isotype switching. Semin. Immunol. 2004, 16 (4): 257–275. PMID 15522624. doi:10.1016/j.smim.2004.08.005. ^ Durandy A. Activation-induced cytidine deaminase: a dual role in class-switch recombination and somatic hypermutation. Eur. J. Immunol. 2003, 33 (8): 2069–2073. PMID 12884279. doi:10.1002/eji.200324133. ^ Casali P, Zan H. Class switching and Myc translocation: how does DNA break?. Nat. Immunol. 2004, 5 (11): 1101–1103. PMID 15496946. doi:10.1038/ni1104-1101. ^ Lieber MR, Yu K, Raghavan SC. Roles of nonhomologous DNA end joining, V(D)J recombination, and class switch recombination in chromosomal translocations. DNA Repair (Amst.). 2006, 5 (9–10): 1234–1245. PMID 16793349. doi:10.1016/j.dnarep.2006.05.013. ^  位于: Shoenfeld, Yehuda. ; Meroni, Pier-Luigi. ; Gershwin, M. Eric. Autoantibodie. Amsterdam ; Boston: Elsevier. 2007. ISBN 978-0-444-52763-9. 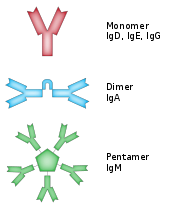 ^ 47.0 47.1 Animated depictions of how antibodies are used in ELISA assays. Cellular Technology Ltd.—Europe. [2007-05-08]. （原始内容存档于2010-11-18）. ^ Stern P. Current possibilities of turbidimetry and nephelometry (PDF). Klin Biochem Metab. 2006, 14 (3): 146–151 [2011-06-21]. （原始内容 (PDF)存档于2010-11-18）. ^ 49.0 49.1 Dean, Laura. Chapter 4: Hemolytic disease of the newborn. Blood Groups and Red Cell Antigens. NCBI Bethesda (MD): National Library of Medicine (US),. 2005. ^ Feldmann M, Maini R. Anti-TNF alpha therapy of rheumatoid arthritis: what have we learned?. Annu Rev Immunol. 2001, 19 (1): 163–196. PMID 11244034. doi:10.1146/annurev.immunol.19.1.163. ^ Doggrell S. Is natalizumab a breakthrough in the treatment of multiple sclerosis?. Expert Opin Pharmacother. 2003, 4 (6): 999–1001. PMID 12783595. doi:10.1517/14656566.4.6.999. ^ Krueger G, Langley R, Leonardi C, Yeilding N, Guzzo C, Wang Y, Dooley L, Lebwohl M. A human interleukin-12/23 monoclonal antibody for the treatment of psoriasis. N Engl J Med. 2007, 356 (6): 580–592. PMID 17287478. doi:10.1056/NEJMoa062382. ^ Plosker G, Figgitt D. Rituximab: a review of its use in non-Hodgkin's lymphoma and chronic lymphocytic leukaemia. Drugs. 2003, 63 (8): 803–843. PMID 12662126. doi:10.2165/00003495-200363080-00005. ^ Vogel C, Cobleigh M, Tripathy D, Gutheil J, Harris L, Fehrenbacher L, Slamon D, Murphy M, Novotny W, Burchmore M, Shak S, Stewart S. First-line Herceptin monotherapy in metastatic breast cancer. Oncology. 61. 2001,. Suppl 2 (Suppl. 2): 37–42. PMID 11694786. doi:10.1159/000055400. ^ LeBien TW. Fates of human B-cell precursors. Blood. 1 July 2000, 96 (1): 9–23 [2011-06-21]. PMID 10891425. （原始内容存档于2010-11-18）. ^ Ghaffer A. Immunization. Immunology - Chapter 14. University of South Carolina School of Medicine. 2006-03-26 [2007-06-06]. （原始内容存档于2010-11-18）. ^ Urbaniak S, Greiss M. RhD haemolytic disease of the fetus and the newborn. Blood Rev. 2000, 14 (1): 44–61. PMID 10805260. doi:10.1054/blre.1999.0123. ^ 58.0 58.1 Fung Kee Fung K, Eason E, Crane J, Armson A, De La Ronde S, Farine D, Keenan-Lindsay L, Leduc L, Reid G, Aerde J, Wilson R, Davies G, Désilets V, Summers A, Wyatt P, Young D. Prevention of Rh alloimmunization. J Obstet Gynaecol Can. 2003, 25 (9): 765–73. PMID 12970812. ^ Tini M, Jewell UR, Camenisch G, Chilov D, Gassmann M. Generation and application of chicken egg-yolk antibodies. Comp. Biochem. Physiol., Part a Mol. Integr. Physiol. 2002, 131 (3): 569–574. PMID 11867282. doi:10.1016/S1095-6433(01)00508-6. ^ Cole SP, Campling BG, Atlaw T, Kozbor D, Roder JC. Human monoclonal antibodies. Mol. Cell. Biochem. 1984, 62 (2): 109–20. PMID 6087121. doi:10.1007/BF00223301. ^ Kabir S. Immunoglobulin purification by affinity chromatography using protein A mimetic ligands prepared by combinatorial chemical synthesis. Immunol Invest. 2002, 31 (3–4): 263–278. PMID 12472184. doi:10.1081/IMM-120016245. ^ 62.0 62.1 Brehm-Stecher B, Johnson E. Single-cell microbiology: tools, technologies, and applications. Microbiol Mol Biol Rev. 2004, 68 (3): 538–559 [2011-06-21]. PMC 515252. PMID 15353569. doi:10.1128/MMBR.68.3.538-559.2004. （原始内容存档于2010-11-18）. ^ Williams N. Immunoprecipitation procedures. Methods Cell Biol. Methods in Cell Biology. 2000, 62: 449–453. ISBN 9780125441643. PMID 10503210. doi:10.1016/S0091-679X(08)61549-6. ^ Kurien B, Scofield R. Western blotting. Methods. 2006, 38 (4): 283–293. PMID 16483794. doi:10.1016/j.ymeth.2005.11.007. ^ Scanziani E. Immunohistochemical staining of fixed tissues. Methods Mol Biol. 1998, 104: 133–140. ISBN 978-0-89603-525-6. PMID 9711649. doi:10.1385/0-89603-525-5:133. ^ Reen DJ. 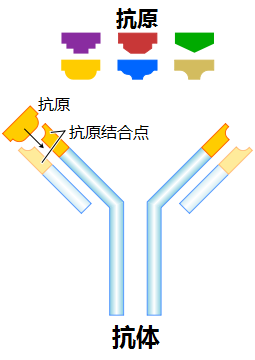 Enzyme-linked immunosorbent assay (ELISA). Methods Mol Biol. 1994, 32: 461–466. ISBN 0-89603-268-X. PMID 7951745. doi:10.1385/0-89603-268-X:461. ^ Kalyuzhny AE. Chemistry and biology of the ELISPOT assay. Methods Mol Biol. 2005, 302: 15–31. ISBN 1-59259-903-6. PMID 15937343. doi:10.1385/1-59259-903-6:015. ^ Whitelegg N.R.J., Rees A.R. WAM: an improved algorithm for modeling antibodies on the WEB. Protein Engineering. 2000, 13 (12): 819–824 [2011-06-21]. PMID 11239080. doi:10.1093/protein/13.12.819. （原始内容存档于2010-11-18）. 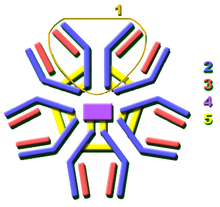 ^ Marcatili P, Rosi A,Tramontano A. PIGS: automatic prediction of antibody structures. Bioinformatics. 2008, 24 (17): 1953–1954 [2011-06-21]. PMID 18641403. doi:10.1093/bioinformatics/btn341. （原始内容存档于2010-11-18）. ^ Sivasubramanian A, Sircar A, Chaudhury S, Gray J J. Toward high-resolution homology modeling of antibody Fv regions and application to antibody–antigen docking. Proteins. 2009, 74 (2): 497–514 [2011-06-21]. PMC 2909601. PMID 19062174. doi:10.1002/prot.22309. （原始内容存档于2010-11-18）. ^ 71.0 71.1 71.2 71.3 Lindenmann, Jean. Origin of the Terms 'Antibody' and 'Antigen'. Scand. J. Immunol. 1984, 19 (4): 281–5 [2008-11-01]. PMID 6374880. doi:10.1111/j.1365-3083.1984.tb00931.x. （原始内容存档于2010-11-18）. ^ Padlan, Eduardo. Anatomy of the antibody molecule. Mol. Immunol. February 1994, 31 (3): 169–217. PMID 8114766. doi:10.1016/0161-5890(94)90001-9. ^ New Sculpture Portraying Human Antibody as Protective Angel Installed on Scripps Florida Campus. [2008-12-12]. （原始内容存档于2010-11-18）. ^ Protein sculpture inspired by Vitruvian Man. [2008-12-12]. （原始内容存档于2010-11-18）. ^ Emil von Behring - Biography. [2007-06-05]. （原始内容存档于2010-11-18）. ^ AGN. The Late Baron Shibasaburo Kitasato. Canadian Medical Association Journal. 1931, 25 (2): 206. PMC 382621. PMID 20318414. ^ Winau F, Westphal O, Winau R. Paul Ehrlich--in search of the magic bullet. Microbes Infect. 2004, 6 (8): 786–789. PMID 15207826. doi:10.1016/j.micinf.2004.04.003. ^ Silverstein AM. Cellular versus humoral immunology: a century-long dispute. Nat. Immunol. 2003, 4 (5): 425–428. PMID 12719732. doi:10.1038/ni0503-425. ^ Van Epps HL. Michael Heidelberger and the demystification of antibodies (PDF). J. Exp. Med. 2006, 203 (1): 5 [2011-06-21]. PMC 2118068. PMID 16523537. doi:10.1084/jem.2031fta. （原始内容存档 (PDF)于2010-11-18）. ^ Marrack, JR. Chemistry of antigens and antibodies 2nd. London: His Majesty's Stationery Office. 1938. OCLC 3220539. ^ The Linus Pauling Papers: How Antibodies and Enzymes Work. [2007-06-05]. （原始内容存档于2010-11-18）. ^ Silverstein AM. Labeled antigens and antibodies: the evolution of magic markers and magic bullets (PDF). Nat. Immunol. 2004, 5 (12): 1211–1217 [2011-06-21]. PMID 15549122. doi:10.1038/ni1140. （原始内容 (PDF)存档于2009-12-18）. ^ Edelman GM, Gally JA. The nature of Bence-Jones proteins. Chemical similarities to polypetide chains of myeloma globulins and normal gamma-globulins. J. Exp. Med. 1962, 116 (2): 207–227. PMC 2137388. PMID 13889153. doi:10.1084/jem.116.2.207. ^ Stevens FJ, Solomon A, Schiffer M. Bence Jones proteins: a powerful tool for the fundamental study of protein chemistry and pathophysiology. Biochemistry. 1991, 30 (28): 6803–6805. PMID 2069946. doi:10.1021/bi00242a001. ^ 85.0 85.1 Raju TN. The Nobel chronicles. 1972: Gerald M Edelman (b 1929) and Rodney R Porter (1917-85). Lancet. 1999, 354 (9183): 1040. PMID 10501404. doi:10.1016/S0140-6736(05)76658-7. ^ Hochman J, Inbar D, Givol D. An active antibody fragment (Fv) composed of the variable portions of heavy and light chains. Biochemistry. 1973, 12 (6): 1130–1135. PMID 4569769. doi:10.1021/bi00730a018. ^ Tomasi TB. The discovery of secretory IgA and the mucosal immune system. Immunol. Today. 1992, 13 (10): 416–418. PMID 1343085. doi:10.1016/0167-5699(92)90093-M.
^ Preud'homme JL, Petit I, Barra A, Morel F, Lecron JC, Lelièvre E. Structural and functional properties of membrane and secreted IgD. Mol. Immunol. 2000, 37 (15): 871–887. PMID 11282392. doi:10.1016/S0161-5890(01)00006-2. ^ Johansson SG. The discovery of immunoglobulin E. Allergy and asthma proceedings : the official journal of regional and state allergy societies. 2006, 27 (2 Suppl 1): S3–6. PMID 16722325. ^ Hozumi N, Tonegawa S. Evidence for somatic rearrangement of immunoglobulin genes coding for variable and constant regions. Proc. Natl. Acad. Sci. U.S.A. 1976, 73 (10): 3628–3632. PMC 431171. PMID 824647. doi:10.1073/pnas.73.10.3628.